1.Compared with other kettles, glass kettle has no unpleasant taste or smell. It provides you with fresh boiled water. 2.It offers you a chance to watch the water-boiling process through the glass. 3.Unlike other kettles, it is much easier to clean as glass enables you see the water stains clearly. 1.The added water shouldn’t exceed the maximum water level. 2.Don’t heat the kettle with no water. 3.The electric kettle should be used along with the power base we sold. Don’t use other power bases. 4.When you heat water, please cover the lid, and don’t pull it out when heating to avoid scalds. 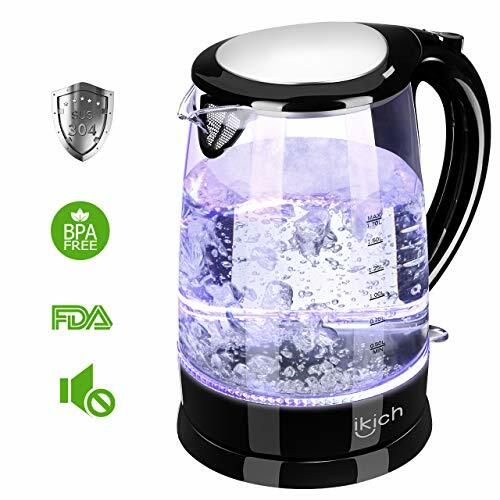 【Energy-saving & auto shut-off】With 1500-Watts power,1.7L capacity glass electric kettle provides 8 glasses of water and 1L water rapidly just 4 minutes. the glass electric kettle is faster than a stove or microwave and using less than half the energy. The auto shut-off mechanism activates within few seconds after the water is fully boiling. 【Maximum Safety】Equipped with bright LED lights to indicate when the kettle is heating. Built with an anti-slip grip and heat-resistant handle, you won’t have to worry about this kettle sliding out of your hands or getting burned with. It is also FDA-APPROVED & BPA FREE. 【Exquisite Detail】Superior temperature controller and heating elements can be used over 5000 times (if 3-4 times a day, approx. 5 years). More details make glass electric kettle more outlast: stay-cool and ergonomic handle,the blue on-off LED，wide opening for cleaning deposits and adding water, low noise (less than 60dB), separable base for convenient serving and cable storage, 62° spout neither drips and spits, etc. 【Worry-free Warranty】You can feel free to use this glass electric kettle, we will provide 45-day money back and 24 months warranty for you.Your satisfaction is our most important service tenet.